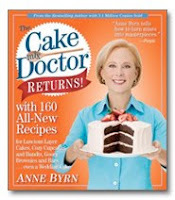 Susan Gray talks to Anne Byrn about easy and delicious desserts from The Cake Mix Doctor Returns. Stephen Usery talks to Todd Wilbur about his latest interpretation of brand name foods in Top Secret Recipes Unlocked. Stephen Usery interviews Tennessee native Madison Smartt Bell about his first novel in five years, Devil's Dream. Devil's Dream is fevered telling of twenty years in the life of Confederate General Nathan Bedford Forrest. We also talk about the appropriateness of Confederate memorials and his return to writing fiction. Courtney Santo talks to Memphis native Lisa Patton about her debut novel Whistlin' Dixie in a Nor'easter. The podcast features ten minutes of extra conversation, including parallels to The Wizard of Oz. Host Bill Wilson talks to Edgar Award winner Harry MacLean about his book The Past Is Never Dead: The Trial of James Ford Seale and Mississippi’s Struggle for Redemption . 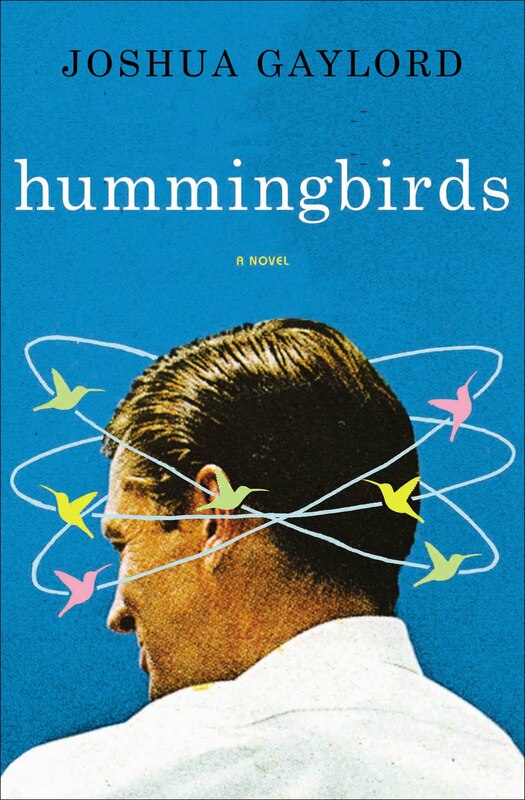 Stephen Usery interviews Joshua Gaylord about his debut novel Hummingbirds which is set in an elite all-girl prep school in Manhattan. Host Dave Lindstrom talks to David Magee about his latest book, The Education of Mr. Mayfield: An Unusual Story of Social Change at Ole Miss. Stephen Usery interviews Bruce Feiler about his latest best-selling book America's Prophet: Moses and the American Story. Stephen Usery interviews British crime fiction sensation R.J. Ellory about his first novel to be published in the United States, A Quiet Belief in Angels. Host Linda Lloyd talks to Haywood Smith about her latest hilarious novel set in the South , Ladies of the Lake. 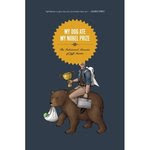 Stephen Usery talks to Jeff Martin about his book My Dog Ate My Nobel Prize: The Fabricated Memoirs of Jeff Martin. Stephen Usery interviews Kaylie Jones about her memoir Lies My Mother Never Told Me about the legacy of growing up as famed writer James Jones's daughter and the toll alcoholism took on the family. Stephen Usery talks to writer, raconteur, and humorist Roy Blount, Jr. about his hilarious, idiosyncratic dictionary, Alphabet Juice ,which is new in paperback. File under"P", for podcast. Stephen Usery interviews Pulitzer-Prize winner Robert Olen Butler about his newest novel Hell which follows TV News anchor man Hatcher McCord trying to extract himself from the inferno. Download the podcast today! Stephen Usery talks to translators Douglas Robinson and Svetlana Ilinskaya about their work on the new collection Rasskazy: New Fiction from a New Russia. The podcast has 36 minutes of extra conversation over the broadcast! Download the interview and hear what you missed! University of Memphis professor and writer extraordinaire Richard Bausch has won the 2009 Dayton Literary Peace Prize for his novel, Peace. Take a half-hour and listen to Bill Wilson's interview with Richard. Stephen Usery talks to Professor Kristen Iversen and the student editors of the University of Memphis's literary journal, The Pinch, about the Fall 2009 issue. Stephen Usery interviews one of the masters of the American short story, Jill McCorkle, about her fourth collection, Going Away Shoes. Congratulations to Book Talk guest and Nashville resident Lydia Peelle for being named to the National Book Foundation's 2009 5 Under 35 program. Past Book Talk guests who have been honored are Fiona Maazel (2008) and ZZ Packer (2006). Stephen Usery interviews Lydia about Reasons for and Advantages of Breathing, her first collection of award-winning short stories. Download the podcast today! Stephen Usery talks to Memphis author Mark Greaney about his debut international thriller starring Court Gentry entitled The Gray Man. Stephen Usery interviews Robert Hicks about his latest novel A Separate Country which follows the life of Confederate General John Bell Hood through his astonishing life after the Civil War in New Orleans.Download the podcast today! 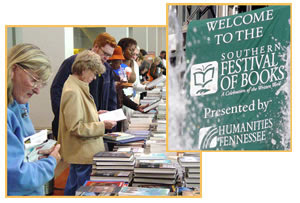 Stephen talks to Michael Osborn about the upcoming Southern Festival of Books in Nashville. Stephen Usery interviews Timothy Hallinan about his newest novel, Breathing Water: A Bangkok Thriller. Breathing Water is the third book starring American expat journalist Poke Rafferty, his Thai wife, Rose and their adopted daughter Miaow. Stephen Usery interviews best-selling author and Memphis native Eric Jerome Dickey about his fourth novel featuring the assassin Gideon, Resurrecting Midnight. Download the podcast today. British writer Simon Van Booy has won the 2009 Frank O'Connor Award for his second collection of short stories Love Begins in Winter. The O'Connor is the most lucrative short story prize in the world, worth 35,000 Euros. Previous winners include Haruki Murakami and Jumpa Lahiri. This is quite an honor, and Book Talk congratulates Simon and thanks him again for sharing Love Begins in Winter with us earlier this year. You can download his interview with Stephen Usery below. Stephen talks to Richard "Dixie" Hartwell about his first novella When the Buddha Met Bubba. 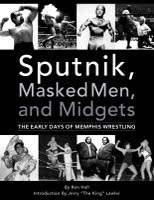 Stephen Usery talks to Ron Hall about his new book Sputnik, Masked Men, and Midgets: The Early Days of Memphis Wrestling. Stephen Usery interviews Dan Chaon, winner of the 2006 Academy Award in Literature, about his critically-acclaimed second novel Await Your Reply which weaves together three plots about identity theft. Bill Wilson talks to guest Clay Travis about On Rocky Top, his investigation of the calamitous 2008 season for the Tennessee Volunteers football team that lead to the firing of Coach Phillip Fulmer. This podcast boasts an extra ten minutes of conversation looking at the prospects for the team under new head coach Lane Kiffin. Stephen Usery interviews the publisher of The Daily News, Eric Barnes, about his debut literary tech thriller, Shimmer. Stephen Usery interviews Nashville resident Lydia Peelle about Reasons for and Advantages of Breathing, her first collection of award-winning short stories. Download the podcast today! Linda Lloyd talks to Robert Dalby about the third installment of his series set in Second Creek, Mississippi A Piggly Wiggly Wedding. 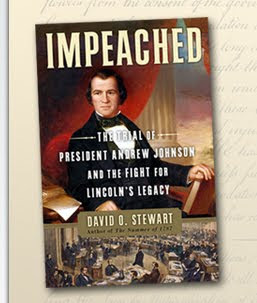 Stephen Usery interviews David O. Stewart about his book Impeached: The Trial of President Andrew Johnson and the Fight for Lincoln's Legacy. It's a fascinating look into the event that presaged the squandered hope of Reconstruction following the Civil War and Abraham Lincoln's assassination. Download the podcast today! Susan Gray talks to one of America's most successful inspirational fiction writers ReShonda Tate Billingsley about her new novel The Devil is a Lie. Host Carolyn Gibson talks to Gin Phillips about her debut novel The Well and the Mine, which looks at the complicated familial and racial relationships in the coal mining area of northern Alabama in the 1930s. In this podcast, Stephen Usery interviews Attica Locke about her debut novel, Black Water Rising, which is set in Houston, Texas's oil boom in the early 1980s as the legacy of racism and corporate greed come to a head. Stephen Usery interviews Sam Haskell about his book, Promises I Made My Mother. It's a memoir that tracks the moral grounding Haskell's mother gave him and how it helped in his personal life and his career as the head of television for the legendary William Morris talent agency. Download the podcast today! Stephen Usery talks to Frank McNair about The Golden Rules for Managers: 119 Incredible Lessons for Leadership Success, his collection of pithy maxims for managers new and experienced. In this episode of Book Talk, Stephen Usery interviews British writer Simon Van Booy about his second collection of short stories Love Begins in Winter. One of Arkansas's and America's most successful writers, E. Lynn Harris died Thursday, July 23rd. Fayetteville (AR) Flyer article on his passing. Here is Stephen Usery's 2008 interview of bestselling author E. Lynn Harris about his novel set in the world of college football, Just Too Good to Be True . Stephen Usery interviews Neil White about his memoir, In the Sanctuary of Outcasts. It's an extremely moving telling of White's time in a federal prison for bank fraud in Carville, Louisiana which in the early 1990s shared facilities with the last American colony for survivors of leprosy, which is now known as Hansen's disease. The podcast has 17 extra minutes of conversation! Linda Lloyd talks to Mary Kay Andrews about her latest, juicy slice of southern hi jinks in The Fixer Upper. Download, listen, enjoy! Stephen Usery interviews Edgar Award-winning author John Hart about his latest thriller, The Last Child, in which a teenage boy searches for his sister a year after her abduction. Download the podcast today! Stephen Usery interviews Karen Essex about her latest historical novel, Stealing Athena which looks at women involved in the creation of the Parthenon and the British removal of many statues from there in the early 19th century. Tune in to Book Talk this Saturday evening at 6:00 p.m. as Stephen Usery interviews Barry Mazor about his new book Meeting Jimmie Rodgers: How America's Original Roots Music Hero Changed the Pop Sounds of a Century. Mississippi native Rogers was one of the world's most popular recording artists in the late 1920s and early 1930s, and has been elected to the Rock 'n' Roll, Blues, and Country Halls of Fame. Download the podcast while you're waitin' on a train. Terri Murphy talks to Todd Bottorff about his self-help guide 21 Things to Create a Better Life. Dowload the podcast today! Stephen Usery interviews Philipp Meyer about his debut novel, American Rust, which is a tale of friendship amidst crime and punishment in a dying steel town in the hills of western Pennsylvania.